Helmeted Hornbills are large birds found in the trees of the Malay peninsular, Sumatra and Borneo. They are the longest of all hornbills, reaching a total length of about 1.6 metres. The actual body is more like a metre long, the difference made up by two long tail feathers. They mostly eat fruit, but that gigantic beak can also be used to break into rotten wood and bark to find insects and the like. This is helped by having a solid casque, which is the sticky-out bit running halfway along the top of the beak. In most hornbills it's spongy to lighten the load, in our hornbill it's made of solid keratin and is known as hornbill ivory. It means that the Helmeted Hornbill's beak can make up as much as 10% of their total weight. Ouch! Hornbills deal with this by having the first two neck bones fused together, which helps them keep control of their own face. Said beak is yellow, but part of it is turned red by secretions of the preen gland. Like most birds, Helmeted Hornbills have a preen gland in their tail and they use their beak to smear the stuff all over themselves. It keeps them clean and dry, it's just a shame it all stays there on the beak and looks a little unsightly when you realise it's waxy, oily stuff. It's not accurate to call it "muck", but it does look like the shoe fits. Clearly, that's not the only thing that's a little unsightly. Helmeted Hornbills have a naked, wrinkly throat that can look quite horrible. It doesn't appear natural, it looks more like a symptom of something terrible. 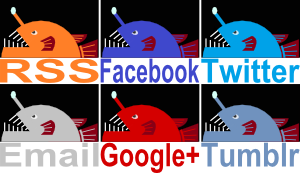 Males have it worse since it is they that have the red/brown coloured one. Females have it in blue/yellow, which at least makes it look utterly inhuman and completely unlike some kind of growth you would take antibiotics for. Remember that beak? How can you forget it. Pairs of Helmeted Hornbills own territory and the males defend their land from others by flying around and beating each other up with their solid beaks. Ouch, again! It's an important mission, though. Females nest in tree hollows, sealing the entrance with mud while she incubates her unhatched eggs. A little hole is left for the male to pass food to her while she's on maternity leave. Once the eggs hatch she breaks out and reseals the entrance again, this time leaving a hole for the pair to feed their chicks. There is just one thing required to complete the picture. The Helmeted Hornbill's call is described as "a series of identical, loud, hollow took notes, gaining in speed before drawing to an amazing climax of maniacal laughter, tee poop notes." Maniacal laughter. He certainly looks the part. That is one ugly bird! I know! I'm glad to have found him. Hahaha! Yeh. I guess I could try and imagine that, but I don't think I should. Who knows where my mind would end up! 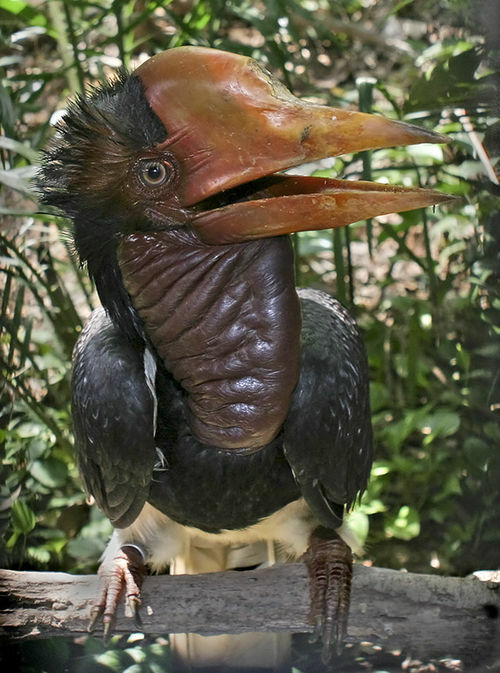 It still blows my mind that a helmeted hornbill would have an opinion as to whether the individual in that picture is attractive or not. You'd think once you hit a certain level of ugly even members of that same species would acknowledge that they are no prize. Helmeted hornbills should thank God for other helmeted hornbills. Ha! I can certainly see your point. 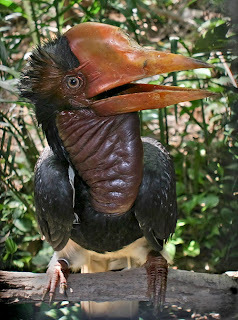 It makes me wonder what a Helmeted Hornbill that other Helmeted Hornbills find unattractive looks like. Hahahaaa! Now, that would turn the world upside-down! I don't at all blame you!